Discussion in 'Anime Series' started by Grin, Jan 2, 2018. In the distant future, a new immortal and genderless life form called Gems populate the Earth. The 28 Gems must fight against the Lunarians, who attack them regularly to abduct them and to turn them into decorations. Each Gem is assigned a role, such as a fighter or a medic. So I started watching this recently and I absolute loved it. The CGI visuals (which usually have a bad rep) with hand-drawn expressions made for a very distinctive look, and the whole thing in general just looks gorgeous. The open grass fields, the snowy winter scenes, all of it is very beautifully done, nothing like the last adaptation of Berserk. The characters, being different gems, are defined to great extent by the traits of the actual gems. They have their hardness levels on the Mohs scale, which for the most part decides who is a soldier and who isn't. Case in point, Diamond with her hardness of 10 compared to Phosphophyllite's 3.5. However, they go beyond that with their distinct personalities and little quirks. Phos, especially, becomes much more than that little number by the end of it. Just ask me and I'll add some more. Finally watched the first episode and it got me quite hooked because I had to watch more. CGI more like ajin than beserker, backgrounds are wonderfull, expressions are handdrawn. Sometimes the movement seemd a bit weird but it is okay. Story seems cool. Interessting setting and scientific logical actions or facts. Since I didn't comment on this anime yet I'll do that now. I can recommend this anime, even if it sounds weird it's worth a try. I rated it 9/10. I feel like my post was written badly, sorry about that. But because @Grin is digging it so much and also because he's always happy about people watching his favorites I started watching it. The word gem really fits the anime. This will be how I advertise it from now on. There's no need for apologies. Your words have reached my heart, Jackson. And I'm...overjoyed. Chaudfontaine and sweetjacky like this. It's more like I like them all but there's some that I like more because they're my favorites xD It's already hard to pick my favorites but I'd say Cinnabar, Phos, Antarctica, Diamond, the one with the long red hair and holes in her chest, Amethyst and maybe Bort. Sorry if I got some names wrong. I also really liked the jellyfish girl. Another thing I want to add is that they were pretty good at making them appear genderless because they often had traits of both genders. Sorry if I got some names wrong. Well you got most of them right! I don't even blame you for not trying to spell Padparadscha. Yeah, some of them lean more on one end or the other. Dia's the girliest, Antarc's more boyish. Hidden plot about what is the origin of gems, ocean jelly creatures and lunarians. 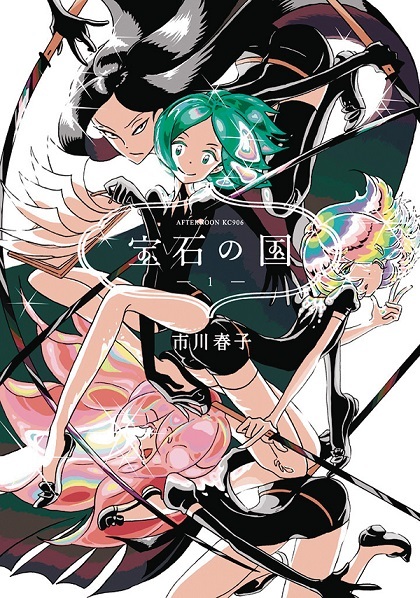 I really want to know more and if phos is able to find out the truth. Chaudfontaine and Grin like this. This is one of the,THE,THE,greatest anime ever created with one of the greatest main characters ever designed.It has the right balance of comedy and drama,both of which are top notch.I unreservedly recommend this to everyone.Even if the synopsis doesn't attract you to try it out,watch the first episode just to see what it's about and I don't think you will regret it.Despite its short length,the quality of this anime easily allows it to compete with many others that are considered to be some of the best.I give it 10/10 and I don't do so lightly,believe me. Grin and Yuuzume like this. Welcome to the club Stormey,and also read the manga for more. By the way @Grin ,new chapter yesterday (as you probably know). We'll find out about the reconstruction of the destroyed ones soon.Let's hope Antarc will live once more. Storm chaser and Grin like this. Thank you. Im gonna read the manga too. Yuuzume and Grin like this. I start watching the anime and i can't seem to get use to the art style.